The construction sector has seen a major boom in the industry with past 5 years as people are more aware with a better sense of housing. And states like Dehradun have emerged as an ideal place to live by. With top notch architecture and amenities on the go, this green city provides easy connectivity with different parts of the town. We all have dreamt about how our ideal home looks like, what we specifically want. But there are many elements which come together to achieve what you seek with your home. It can be easy convenience or amenities or being spacious. But one of the biggest issue that people are facing when looking for 2 or 3 bedroom flats in dehradun is the price. But this situation is also tackled by one the successful names in real estate industry, Pacific group. The group has been working hard with providing the most lavish residential experience at nominal prices. 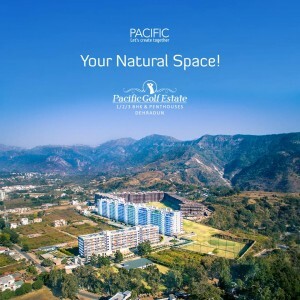 The group has launched the infrastructure aid in the face of Pacific Golf-Estate in Dehradun providing most lavish 3, 2 & 1 bedroom flats in dehradun. After receiving an overwhelming response with Pacific hills, the group initiated the same root work for Golf-estate project. This lush green project is spread across 35 acres of land amidst mountains featuring a signature golf course. This intelligently designed land offers the best of amenities at your doorstep. This features hospitals, schools, commercial complexes and much more at easy connectivity from your home. Each residential unit is designed to comfort each type of buyer. Be it a bigger family looking for a penthouse or a couple considering to buy 2 bedroom flats in dehradun. The group has always believed in delivering as promised and being loyal to its customers. And the same can be seen with its already offered possession in project’s phase 2.